Ruari McNally leaves Antrim Court on Tuesday. 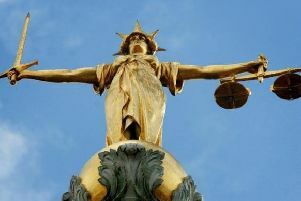 A drunken stag-do reveller who swore at and “squared up” to cabin crew on a flight to Ibiza was fined £260 on Tuesday. Having heard that 24-year-old Ruari McNally acted aggressively, shouted and “repeatedly” told a member of the Jet2 crew to “f*** off,” Antrim Magistrates Court District Judge Oonagh Mullan told him “you should be absolutely ashamed of your behaviour”. Allowing the unemployed painter and decorator 26 weeks to pay the fine along with a £15 offenders levy, she berated McNally that such loutish behaviour was “becoming all too prevalent”. DJ Mullan also told McNally that given he was sitting at an emergency exit, “you were putting other passengers at very real risk and that is deplorable to say the least”. McNally, from the Kilrea Road, Upperlands in Maghera, had earlier pleaded guilty to a single charge of being drunk in an aircraft on September 1 last year. A prosecuting lawyer told the court how McNally was part of a 14-strong stag do flying to the party island of Ibiza and the “fasten seat belts” was still illuminated when McNally stood up. “There was a PA announcement for passengers to remain seated,” said the lawyer adding that when the crew were doing their duties, they spotted a half drunk bottle of vodka beside McNally so “it was clear he was drunk”. McNally was “warned about his behaviour” and the crew requested he hand over his passport and it was then that he “repeatedly told him to f*** off,” leading the male crew member to “feel that he would be punched - he feared for his safety”. The Spanish police were asked to meet the plane when it arrived but McNally wasn’t interviewed until he was back in Northern Ireland, admitting that he had been disruptive. Defence lawyer Chris Sherard said McNally “recognises that his behaviour fell far below that which would be expected,” adding that he “apologises” to both the crew and other passengers for his behaviour “which he bitterly regrets”. The lawyer revealed that two other revellers had been refused entry onto the flight because they were drunk and that in fact, McNally had initially been served alcohol in the flight before problems arose but despite all that, “he is apologetic for his actions”. Imposing the fine, DJ Mullan said it was “effectively £10 out of our benefits every week” and warned McNally that failure to pay it could result in him going to jail in default. “You need to be aware of the inconvenience you caused to members of the crew and you put people at risk on the day in question, never mind the unpleasantness for the other people travelling,” the judge told McNally.